In our previous blog we highlighted the key aspects of the Annual Return GSTR-9. We'll now take up various sections of GSTR 9 for detailed analysis. 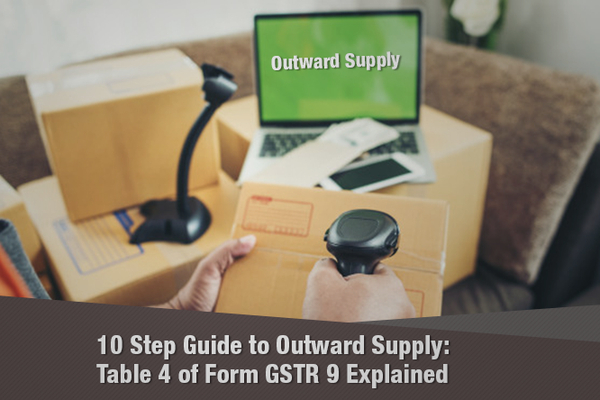 This blog focuses on the outward supply details to be included in GSTR 9. Should include all the details pertaining to the period July 2017 to March 2018 irrespective of the period (Maximum period September 2018) when such details are reported in GSTR 1. Amendments to invoices related in any month in the GSTR 1 during 2017-18 made by reporting such amendment in the GSTR 1 during the months period April 2018 to September 2018 would only be reported in Part VI Sl.No. 10 of GSTR 9. Aggregate value of supplies made to consumers and unregistered persons on which tax has been paid shall be declared here. These would include details of supplies made through ecommerce operators and are to be declared as net of credit notes or debit notes issued in this regard. Aggregate value of supplies made to registered persons (including supplies made to UINs) on which tax has been paid shall be declared here. These would include supplies made through ecommerce operators but shall not include supplies on which tax is to be paid by the recipient on reverse charge basis. Details of debit and credit notes are to be mentioned separately. 4C of GSTR 9 contains information relating to a sub-set of all zero-rated supplies comprising of exports of goods and exports of services out of India. 4C does not include supplies to SEZ. Further, exports are permitted in two ways, namely, export with payment of tax and export without payment of tax. 4C contains information pertaining only to exports on payment of tax and not exports without payment of tax. 4D of GSTR 9 contains information relating to a sub-set of all zero-rated supplies comprising of supplies to SEZ being a D\developer of the SEZ or a unit in the SEZ. It would include supplies to SEZ whether by an SEZ to another SEZ or by a DTA unit to SEZ. 4D does not include supplies to SEZ without payment of tax. Deemed export - Sl. No. 4E. 4E of GSTR 9 contains information regarding ‘deemed export’. Section 147 allows the Government to notify certain supply of goods to be deemed exports where the goods supplied do not leave India and the payment for such supplies is received either in Indian rupees or in convertible foreign exchange if such goods are manufactured in India. The deeming fiction of this kind of supply as deemed export allows a person to enjoy all the tax benefits as available in case of zero-rated supply. 4F of GSTR 9 contains details of advances received in certain special circumstances. As per rule 50, upon receipt of advance, Receipt Voucher is required to be issued but tax Invoice is not required to be issued until actual supply in respect of said advance. Tax is payable on advance even though supply is pending. 4F to contain details of advances received and tax invoice is yet to be issued. Refer NN 40/2-17-CT dated Oct 13, 2017 that exempted payment of tax on advances received towards supply of goods, in case of taxable persons whose aggregate turnover is or is likely to be less than Rs.1.50 cr. Advances towards supply of services remained liable to payment of tax on advances. Suppliers of goods above this threshold limit also were liable to payment of tax on advances. Refer NN 66/2017-CT dated Nov 11, 2017 that exempts from payment of tax on advances received towards supply of goods. As such, advances should have been subject to tax payment in all cases up to Nov 10, 2017 and in respect of advances relating to supply of services without the benefit of this exemption. Inward supplies on which tax is to be paid on reverse charge basis – Sl No. 4G. 4G in GSTR 9 contains details of inward supplies in respect of which registered person is liable to pay tax on reverse charge basis. Reverse charge provisions are guided through section 9(3) and 9(4) of the CGST Act in case of intra state supplies. In case of inter-state supplies, the corresponding sections of 5(3) and 5(4) of the IGST Act would be applicable. Refer NN 8/2017-CT(R) dated Jun 28, 2017 exempts intra-State supply of goods or supply of services does not exceed Rs.5,000/- per day regardless of number of suppliers involved. Refer NN 38/2017-CT(R) dated Oct 13, 2017 which excluded the value limit previously prescribed. Corresponding Integrated tax exemption was issued for the first time in NN 32/2017-Int(R) dated Oct 13, 2017 in respect of inter-State supplies. 4I in GSTR 9 contains details of credit notes in respect of outward supplies in 4B to 4E of GSTR 9. Credit notes dated before Mar 31, 2018 alone is required to be reported and not Credit notes relating to 2017-18 but issued in 2018-19. Aggregate value of credit notes issued in respect of B to B supplies (4B), exports (4C), supplies to SEZs (4D) and deemed exports (4E) shall be declared here. 4J in GSTR 9 contains details of debit notes in respect of outward supplies in 4B to 4E of GSTR 9. Debit notes dated before Mar 31, 2018 alone is required to be reported and not debit notes relating to 2017-18 but issued in 2018-19. Aggregate value of debit notes issued in respect of B to B supplies (4B), exports (4C), supplies to SEZs (4D) and deemed exports (4E) shall be declared here. Details of amendments made to B to B supplies (4B), exports (4C), supplies to SEZs (4D) and deemed exports (4E), credit notes (4I), debit notes (4J) and refund vouchers shall be declared here. Table 9A and Table 9C of FORM GSTR-1 may be used for filling up these details. As per section 39(9) of the CGST Act, if any Registered Person discovers any omission or incorrect particulars, he can rectify such omission or incorrect particulars in the return to be furnished for the month during which they are noticed. Further, Circular no. 26/26/2017-GST dated Dec 29, 2017 prescribes the procedure for a person to correct any error or omission made in his GSTR 3B and GSTR 1. It is important to note that declaration of omissions and amendment to declaration already made are permitted in any subsequent month even in the returns of Apr to Sept 2018. Such declarations and amendments by transposing from one month to another but within 2017-18 must be reported here. Continuation of such declaration and amendments in 2018-19 of data relating to 2017-18 is not permitted in point 4K. It is required to be carried in Pt. V point 10 and 11, as applicable.